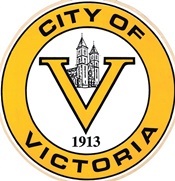 The City of Victoria can automatically transfer the proper amount from your bank account on the day it is due. Just stop by City Hall and fill out the necessary form to get this convenient service started. Sewer averaging is done each year from December 20 through March 20. Your sewer rate for the entire year is based off your water usage during this time. For those residents who are 65 or older, a discount is given on your trash rate. Stop by City Hall to apply once you have reached this milestone. Only hand watering of trees, flowers and gardens. No unattended hoses. Such watering shall not take place between the hours of 10:00 am and 5:00 pm. No filling of swimming pools or hot tubs. No filling of water storage containers. Waste of water will be prohibited. Run washers and dishwashers only when they are full. Plug the bathtub drain before turning water on. Replace gaskets on drippy water faucets. Use a spade or trowel to check moisture in the lawn, two inches under the soil surface, you don't need to water yet.